This is Scottish and World Mental Health Week. The aim is to raise public awareness about mental health issues. The week promotes open discussion of mental disorders, and investments in prevention, promotion and treatment services. This year the theme is “Depression: A Global Crisis”. Over recent years, there has been growing recognition of the extent of mental health issues in the workplace and outside. A quick look at any employer's absence statistics will show that mental health is a significant and growing proportion of absence. The pace of work and public service cuts have put stress much higher up the health and safety agenda. In Scotland we have the excellent 'See Me' campaign that seeks to end the stigma associated with mental health, a condition that will affect one in four Scots. A YouGov survey commissioned by ‘See Me’ has revealed that while 60 per cent of Scots say they would not find it hard talking to a person with a mental health problem, a sizeable number of Scots are still unsure how to address mental ill-health. Helping inform and educate their members and representatives to understand the issues. The TUC has compiled a useful resource list (http://www.tuc.org.uk/extras/mentalhealth.pdf) I would also particularly recommend The Labour Research Department's 'Stress and mental health at work - a guide for union reps'. This can be ordered from www.lrdpublications.org.uk for £6. Any organisation can do a lot to end the stigma associated with mental health. Scottish and World Mental Health Week is an opportunity to highlight the wide range of resources out there to help. The latest stunt from George Osborne is a new kind of employment contract called an owner-employee. Having messed up the economy, why not dabble in another minister’s portfolio! New, so called owner-employees will be required (optional for existing staff) to swap some of their employment rights for between £2k and £50k of shares in the business they work for, any gains on which will be exempt from capital gains tax. The rights are unfair dismissal, redundancy, the right to request flexible working/time off for training and providing 16 weeks’ notice of a firm date of return from maternity leave, instead of the usual 8. Legislation will come later this year so that companies can use the new type of contract from April 2013. The Government will consult on some details of the contract later this month. This Beecroft style proposal has all the hallmarks of a wheeze suggested to the Chancellor over one of those expensive fund raising dinners. It also has the attraction of diverting attention from the mess he is making of his own portfolio at the Tory Party conference. A few initial problems spring to mind. · These workers will ‘own’ nothing. A handful of shares does not give an employee any real ownership say in the running of the business. But they do take the financial risk of the real owners running down the business and making the shares worthless. We have seen this happen in other employee share ownership schemes. · The most likely time an employer will want to sack a worker is when the firm is doing badly. At that time the shares will probably be worthless. So no job, no redress and no cash. · Growing small firms actually don’t want to spread ownership because it could impact on the ability to sell the firm. That’s why they insert ‘bad leaver’ terms into the share ownership provisions. If the Treasury blocks this option, as their PR implies, the scheme becomes unattractive. · You can already sense dodgy law firms suggesting ways this could be exploited to cowboy employers. For example, cut the pay of new starts by £2k and replace it with shares under this scheme and, for not a penny, you are exempt from unfair dismissal etc. · The problem with this and other attempts to weaken unfair dismissal is the unintended consequences. If straightforward unfair dismissal is not available workers and their advisors are more likely to look at the underlying causes of the dismissal. This brings much more complex and expensive legal action into play, including discrimination. · As tax law is involved there will inevitably be some complex procedural requirements. In fact the very red tape the Chancellor is so fond of complaining about. Many employers will simply say it isn’t worth the effort. Particularly as very few of them think employment rights are a problem anyway. With a bit more time I am sure I could come up with many more. The Treasury risk register on this one would make interesting reading. Although I suspect this nonsense was cobbled together so quickly that officials will be scurrying around trying to give the appearance that it will work. Scottish Conservative Leader Ruth Davidson has today achieved what I would have thought was impossible for any Scottish political leader. She has out Mitted, Mitt Romney. Not satisfied with rubbishing nearly half the electorate, she has rubbished 88% of Scots with her speech line, "It is staggering that public-sector expenditure makes up a full 50 per cent of Scotland’s GDP and only 12 per cent of people are net contributors". She is wrong again on net contributors, because elsewhere in the Gers report the figure is given as 34%. Of course all of these figures are highly speculative because we don't know how much individuals pay in indirect taxes. As her ConDem government has been increasing taxes on the poor through VAT, this is particularly insensitive. The political strategy behind this is also unclear, assuming there is one. Even Tories are bewildered if my Twitter feed is anything to go by. And if you are going to do this sort of thing, get your key facts lined up. Her subsequent media performances have highlighted huge gaps in her brief. In particular, if you are going to rubbish Scots make sure you know what the equivalent numbers are in England. If she had bothered to check, they are roughly the same. Putting to one side the ineptness, the more serious point is what this says about her view of many Scots. Apparently nurses, doctors, teachers, police staff and others don't contribute to the economy. This is simply nonsense. Public services support the economy in so many ways and of course the spending benefits firms directly through contracts, some £8bn, and through spending on the high street. To give just one example, research by APSE shows for every £1 spent by a local council there is an economic return, of £1.64 to the local economy. It is precisely because of the job losses and pay freeze that we are in the deepest and longest recession since the 1930’s - when the same crazy economics were last tried. If this is Ruth Davidson’s strategy for digging the Tories out of their electoral hole in Scotland, it’s already time for another U-turn. The latest figures on pay show that the the union premium, the gap between average wages of union and non-union members, has grown to 18.1%. That's £14.18 per hour compared with £12.01. Even the 'adjusted premium' is around 8% higher. That's the biggest percentage gap since 2008, showing that even in a recession unions are more successful in halting the downward pressure on wages. Increases in pay have mostly been in the private sector due to government pay policy, but the public sector premium remains higher. 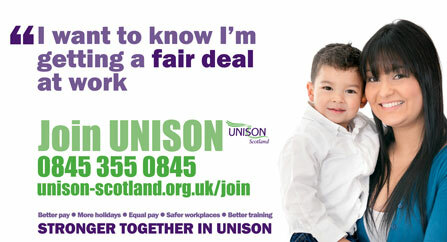 There is also a union premium for other terms and conditions including holidays and pensions. Despite 30,000 public sector job losses in Scotland, UNISON membership has remained pretty stable. Achieved because more existing staff are recognising the importance of union membership in difficult times. When times are tough it is more important than ever to to have the backup of a strong union. It is however important that we take this message to all our workplaces. 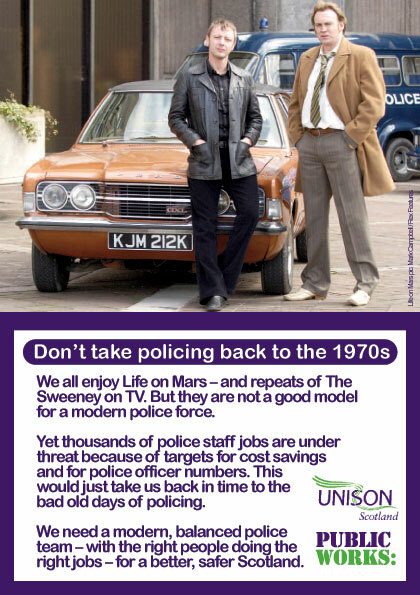 So UNISON branches and staff will be targeting specific workplaces over the next few months. In support of this effort my team have developed a range of adverts and campaign materials as a backdrop to what we call the 'Stronger in UNISON' campaign. So expect to see buses, taxis and billboards with these materials on them across Scotland. You can see some examples here. I was at the European film premiere of We’re Not Broke last night, part of the Take One Action film festival. I was also a member of the post film discussion panel. The film follows the actions of USA Uncut members in their protest actions across the US. They modelled themselves on the UK Uncut model in highlighting tax dodging companies and the consequential cuts in public services. The film also explains how multi national corporations transfer funds across the globe, using tax havens to avoid US business taxes. Equally powerful was showing how corporations influence, well buy actually, the US legislature on tax issues. There was also a clip of another panel member, Jolyon Rubenstein’s (BBC The Revolution will be Televised), film highlighting Philip Green’s tax dodging activities. As I pointed out, Green was hired by Cameron to advise on public service efficiency. You really couldn’t make this stuff up! While the film focuses on the US, there were plenty of messages for us in Scotland and the UK. Not least because many of these tax havens have the Union Jack in their flags. In effect the Queen is the head of the world’s leading tax dodging corporation! Those in the SNP leadership who really think Ireland’s Corporation Tax rate is the way Scotland should go, should also watch the film. It’s done little for the desperate Irish economy and as the US experts pointed out, these corporations are not interested in halving Corporation Tax, they want zero tax. It’s just a race to the bottom. Another message for us was the role of the big accountancy companies in oiling the wheels of corporate tax dodging. As an audience member pointed out, these are the very same companies brought in to advise on efficiency in Edinburgh council and others. Again you couldn’t make this up. I set out our response to austerity economics through the Public Works and Better Way campaign messages. In the US the Tea Party and others focus on all tax is bad, government is evil etc. There is some of that here with the Tax Dodgers Alliance, but the particularly British take is, “We are all in this together”, invoking some sort of Dunkirk spirit. Of course ConDem spending cuts and tax increases hit the poorest hardest, while real wages are cut and the rich tax dodge their way to record levels of wealth. There was a good debate about different methods of protest. Jolyon emphasised creativity as a tool and Christian Aid drew attention to their Tax Justice Bus that is in Edinburgh today. I highlighted the opportunity presented by the Procurement Bill that will be presented to the Scottish Parliament next year. If companies want to benefit from taxpayer pounds they should pay taxes as well. Including aggressive tax avoidance as a factor in tender evaluation would send a very clear message to corporate Britain that those of us who do pay our taxes have had enough. I also urged the good folk of Edinburgh to take a trip to Glasgow on Oct 20 and join the STUC march for ‘A Future that Works’.